Illinois University scientists have developed a new graphene coating that expunges oxygen out of lithium battery fires. Lithium batteries suffer from a phenomenon called ‘thermal runaway’ which causes lithium-driven EVs and other electronics to explode catastrophically. The reason why lithium batteries catch fire is due to a number of factors such as rapid cycling or charging and discharging, and high temperatures in the battery. These conditions can cause the cathode inside the battery – which in most cases is a lithium-containing oxide, usually lithium cobalt oxide – to decompose and release oxygen. If the oxygen combines with other flammable products given off through decomposition of the electrolyte under high enough heat, spontaneous combustion can occur. Associate professor Reza Shahbazian-Yassar and his team has been investigating how to prevent oxygen from leaving the cathode and mixing with other flammable products in the battery. It should be noted that this area of research isn’t new to Shahbazian-Yassar; he and his colleagues have previously used graphene to help modulate lithium buildup on electrodes in lithium metal batteries. Graphene sheets are impermeable to oxygen atoms. It is also strong, flexible and can be tuned to be electrically conductive. Keeping this in mind, Shahbazian-Yassar and grad student Soroosh Sharifi-Asl sought to chemically alter the graphene to make it electrically conductive. Next, they wrapped the tiny particles of lithium cobalt oxide cathode electrode in the conductive graphene. 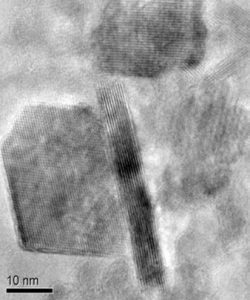 Next, they bound together the wrapped particles with a binding material to form a usable cathode, and incorporated it into a lithium metal battery. When they measured the released oxygen during battery cycling, they saw almost no oxygen escaping from cathodes even at very high voltages. Moreover, to the team’s credit, the lithium metal battery continued to perform well even after 200 cycles.